Lisa Jameson, an Associate Professor of Art Education in the Department of Visual Arts at Northern Kentucky University, recently signed up to host a Slow Art Day event at the Cincinnati Art Museum in Cincinnati, Ohio. After she sent a great introductory note to the host community, we got in touch to find out more about her thoughts on art, art education and of course, Slow Art Day. Slow Art Day: First, tell us a little more about what you do – how are you involved in the arts? Lisa: I teach Art Education at Northern Kentucky University, near Cincinnati, OH. There I train future art educators and teach classes in art integration to Elementary Education majors who will be general classroom teachers. I am also a visual artist with an MFA in Drawing as well as a Certified Zentangle Teacher. I taught children’s art classes for many years and continue to do so. It intrigues me that children are naturally curious and eager to delve into art making at least until they reach about 11. At that point they stop, either because their interests turn to other things, or because they become self critical. Many of my Elementary Education students have not taken art since that age. And it has been through these non-art majors that I have learned how satisfying it is to enable adults who think they “can’t” make art re-discover the joys of the creative process. I hope in turn they will give their students the same opportunities. Slow Art Day: What is one of your favorite artworks? What do you enjoy about it? 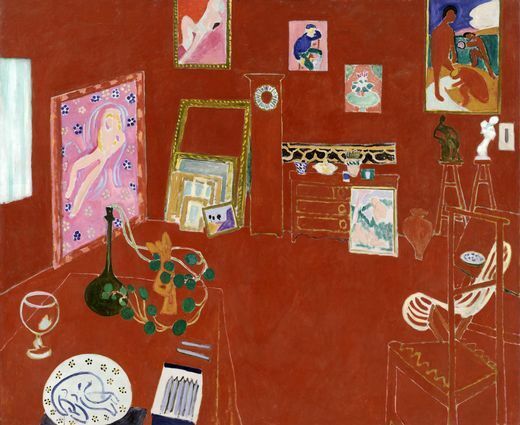 Lisa: One of my all-time favorites works of art is “The Red Studio” by Henri Matisse. There is something so engaging about how he plays with space, line and color-all enveloped in that gorgeous red. Henri Matisse, The Red Studio, 1911. Oil on canvas, 71 1/4″ x 7′ 2 1/4″ (181 x 219.1 cm). Mrs. Simon Guggenheim Fund. © 2013 Succession H. Matisse, Paris / Artists Rights Society (ARS), New York. Image courtesy of the Museum of Modern Art, New York. Slow Art Day: How did you first hear of Slow Art Day? Lisa: I found out about Slow Art Day by chance. I was thinking one day, out of the blue, that there must be a “slow art” movement akin to the slow food movement. I did a Google search for “slow art” and found Slow Art Day! Very exciting! Slow Art Day: Why did you decide to become a host? Lisa: Cincinnati did not have anyone hosting, which surprised me. I signed up immediately. Who wouldn’t want to be a part of an international art event that encourages taking one’s time while viewing works of art and shares my passion for helping adults discover that they can relate to and understand (and make) art. How often do we really get to be part of something like that? Slow Art Day: Have you started thinking yet about the design of your Slow Art Day event? Lisa: I have been thinking about it but have not yet made my choices. They will likely be some of the “hidden gems” vs. the “greatest hits” of the collection. Slow Art Day: Thank you, Lisa, for taking the time out of your busy schedule to talk to us – and for being one of 150+ volunteer hosts around the world. If you’re in the Cincinnati area, make sure to check out her Slow Art Day event at the Cincinnati Art Museum.